Whistler Snow Removal and Salting encourages safety as well as building maintenance for local business and homes. Whistler is Canada’s number one destination for skiing, snowboarding and winter sports. In colder months the streets are buzzing with people and safety is more important than ever! Let is help keep the snow on the mountains and out of the streets. With an average snow fall of 418.7 inches per year it is difficult to keep up with the weather. Lucky for you, having a team behind you, makes it that much more manageable. Our experts not only function as a Whistler Snow Removal and Salting service but organize preventative measures as well. We are always watching forecasted snow falls and changes in climate that may cause ‘slip and fall’ conditions. Due to the constant foot traffic in and around Whistler, it is very important for business owners as well as residences to maintain a certain level of safety on their property for those visiting, shopping or just walking. Whistler Snow Removal and Salting is important for other areas of the home or business as well. As the temperatures begin to change, snow which has built up around structures such as business, hotels or houses are at risk of flooding, should the water runoff find its way inside. Proper salting is also a necessity for safety on the road. Whistler is known for colder climates as well as steep inclines due to its mountainous terrain. Salting reduces the risk of accidents as well as slides. However, you never underestimate the importance of the parking brake! The falling of snow means more responsibility for property owners and although that does not sound menacing at first, the extra time needed for Whistler Snow Removal and Salting can be a pain for those with busy lifestyles. In addition, Whistler residents may find the physical aspect of Snow Removal and Salting very draining. 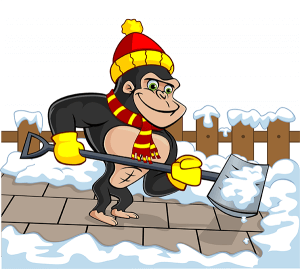 Our Gorillas never tire and would gladly take on these chores so you can rest easy and comfortably inside while we clear away your fluffy, white dilemma. As well as understanding the importance of discretion while your guests and neighbours sleep, our Gorillas move through the night quietly, meticulously clearing and salting around your property, all under WCB regulations.